Yes, that is how I would describe the Honda Accord 2010 - powerful but fuel efficient. It is what I basically like about this mean machine. But, there is more to know about it. Read below to know more about it. 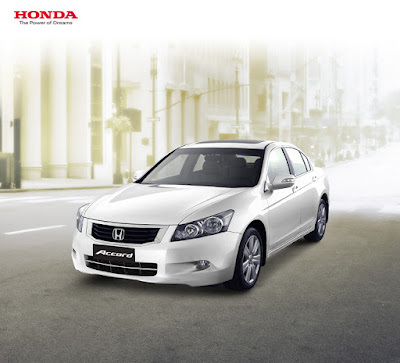 Honda’s highly acclaimed premium sedan adds new dimension to rich styling with the 2010 Accord. Presenting a well-appointed interior design for the latest Accord, Honda Cars Philippines, Inc. offers an enhanced model that carries out what the market asks for. Committed to provide ultimate customer satisfaction by paying regular attention to consumers’ voice, the 3.5 liter Accord is now fitted with sleek and supple BLACK LEATHER SEATS. The 2010 Honda Accord’s interior is delicately crafted with only the finest materials to draw out an air of opulence that matches its bold and sophisticated exterior. The Accord’s plush black leather seats provide comforting luxury that is also easy to maintain. Controls for audio and air conditioning system are also improved for better functionality and ease of use. Beyond great styling, the Honda Accord also offers flawless performance that heeds your need for power without sacrificing fuel economy. The Honda Accord’s high caliber features make it perfect for those in control and those keen on substance. Powered by the i-VTEC (Intelligent Variable Valve Timing and Electronic Lift Control), the 3.5 liter variant ably responds to your heart’s desire with its maximum power capacity of 275 ps @ 6200 rpm. Such variant is also equipped with the latest advancement in fuel-efficient technology called, Variable Cylinder Management (VCM). With the VCM system, optimal power output, promising fuel economy and lesser harmful emissions in actual driving situations become possible by simply closing down cylinders when not needed. VCM tailors the number of cylinders to be activated to match one’s driving requirements. Such seamless activation and deactivation of cylinders from 6 to either 4 or 3 brings about the coining of its nickname, VCM 6 4 3. "During start-up, acceleration, high-speed driving along North Luzon Expressway or uphill climbing to Baguio City, the engine operates on all 6 cylinders to unleash the full power potential of the Accord. For mid-speed driving along Subic or climbing a moderately inclined road, the engine deactivates 2 cylinders and runs on 4 cylinders. Meanwhile, fuel economy is optimized while cruising around town on moderate speed or driving downhill from Tagaytay. It is when the engine runs at 3 cylinder mode while the other 3 cylinders are closed down. It’s like having three engines in one with the VCM system! " said Mr. Voltaire Gonzales, Department Head for Vehicle Sales and Corporate Communications of Honda Cars Philippines, Inc. The ingenuity behind Honda’s VCM system actually complements the VTEC concept. VTEC adjusts valve timing and valve opening depending on the driving situation to optimize fuel economy and power output. Honda uses VTEC mechanism in closing down cylinder as it deactivates and closes the cylinder intake and exhaust valves. For inactive cylinders, spark plugs continue to fire up to keep the cylinders clean. The 2010 Honda Accord comes in refined colors that accentuate its clear-cut lines and over-all modern finish: Alabaster Silver (2.4 liter variant only), Bold Beige (2.4 liter variant only), Polished Metal, Night Hawk Black and Brilliant White Pearl (3.5 liter variant only). It is available in two variants: 2.4 liter with automatic transmission comes with Php 1,680,000 price tag while 3.5 liter variant with automatic transmission is priced at Php 2,030,000. Additional Php 20,000 is applicable for the exclusive Brilliant White Pearl color. Experience for yourself the Honda Accord’s most advanced technologies in its class. Visit any of Honda’s 26 dealerships nationwide or check out www.hondaphil.com for more details. Just always remember to try before you buy. Be smart! Test drive!